MB USED to wander near Hanuman Temple at Connaught Place, Delhi, troubling no one but her self-hygiene was extremely poor. Occasionally, she would be seen disrobing herself. The local paanwala provided her food but all efforts to communicate with her yielded a naught. On many occasions, rickshaw pullers and others would exploit her sexually. This was the reason the paanwala was apprehensive when members of Aashray Adhikar Abhiyan (AAA) approached her for treatment and asked them to come with a woman volunteer. He was still not sure when they did follow up with a woman volunteer and decided to accompany MB to the health camp held on selected days near Jama Masjid. Today, MB is able to take care of herself showing remarkable improvement. The mobile clinic run by the Institute of Human Behaviour and Allied Sciences (IHBAS) and AAA is especially aimed at mentally ill who live on streets of the capital. That they represent the most vulnerable of our society is a known fact. In absence of any residence, homeless are often denied Constitutional rights and redressal mechanism by which they can try gain any modicum of a respectful living. There is strong evidence to suggest that severe mental illness is more common and profound among the homeless than the securely domiciled. The difficulties of addressing combined substance abuse and mental illness, which exists in this group, has long been acknowledged. Several estimates suggest that almost half of the homeless population suffers from some form of mental illness. 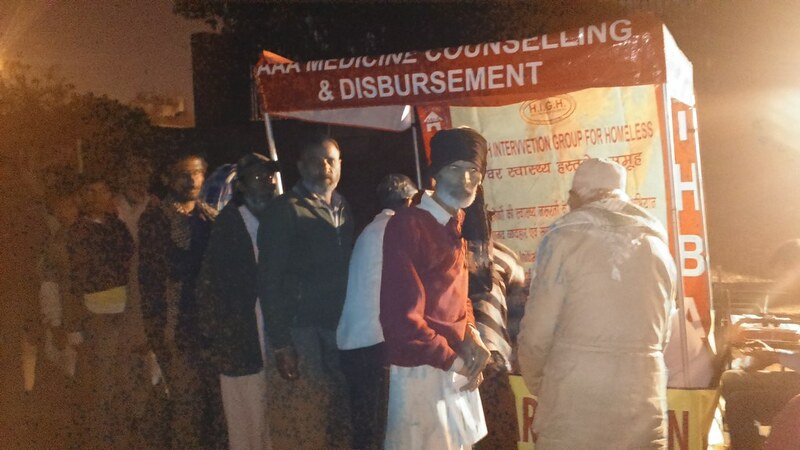 Started in 2000, the health initiative of IHBAS and Aashray Adhikar Abhiyan reaches over a thousand people in a month and has till date treated and helped over 7 lakh people living in and around Delhi alone. Doctors not only treat ailments of the homeless and economically-vulnerable, but also give group counselling sessions to those suffering from substance abuse. Praveen was addicted to narcotics for 22 years and would relapse after every stay at de-addiction centres. “With AAA and IHBAS it’s the emotional support they provide which helps you go clean,” he claims. Praveen now helps with the group counselling sessions and also acts as a night watcher, bringing many homeless and people with substance abuse to this outreach camp. SB had been staying near Jama Masjid for three years and often turned hostile towards passersby. No meaningful conversation was possible with her. Considering her status, treatment was considered necessary and SB was admitted at IHBAS’s in-house facility under the Mental Health Act, 1987. She improved significantly and was discharged after four weeks. She told the doctors that she was suffering from mental illness for long which also made her husband leave her. Though she had married daughters and a brother in Bihar, she preferred staying in Delhi with her companion. SB has now gained understanding about her illness and has agreed to take depot injectable for ensuring compliance. A detailed rehabilitation plan was made for SB who inturn also helped doctors in convincing her companion to start treatment for his cannabis and alcohol abuse. Both of them now sell sells dry fruits near Urdu Park at Jama Masjid. SB will soon get a voter identity card and bank account with help of AAA for a more stable social life. SB has now gained understanding about her illness and has agreed to take depot injectable for ensuring compliance. A detailed rehabilitation plan was made for SB who inturn also helped doctors in convincing her companion to start treatment for his cannabis and alcohol abuse. Both of them now sell sells dry fruits near Urdu Park at Jama Masjid. The process of assisting the mentally-ill homeless starts with local volunteers fanning out and identifying people with severe mental illness. They follow them for a few days to decipher a pattern in their wanderings and locations they visit regularly. “This helps in following up with a patient as he/she can be accessed at these locations,” says Dr Nimesh Desai, the director of IHBAS. The volunteer then brings these identified persons to the camp which is held for selected days of a week. However, in absence of a family member, the consent to start involuntary treatment would require legal authorisation which can take so long that many a times the patient goes missing. It was then that a strategy was devised and the group entered collaborated with the local legal services authority. A local magistrate started sitting on location during clinic hours to give direct orders for starting the treatment. While the group handled legal issues with a smart solution, other obstacles can’t be easily resolved. “There are several challenges such as maintaining the hygiene and making arrangements to provide basic necessities to the homeless. These things cannot be done by force and it needs an innate motivation to help the needy, undeterred by the constraints or even resistance from the shelter inmates in some cases,” says Sanjay Kumar, deputy director at AAA. The biggest problem remains that of finance. Though many have applauded their efforts, there is little or no outside help from any organisation. The group had also approached many dispensaries and even pharmaceutical manufacturers to avail medicines at cheaper rate, but they got a negative response from all of them. As such, the people involved in this initiative are putting in their money for getting the medicines required for the treatment of the homeless and the others, as well as for their food, clothing and shelter. Such an initiative becomes hard to follow up after some time because of the large demand, but very little capacity to address the issue. The biggest problem remains that of finance. Though many have applauded their efforts, there is little or no outside help from any organisation. The group had also approached many dispensaries and even pharmaceutical manufacturers to avail medicines at cheaper rate, but they got a negative response from all of them. Aashray Adhikar Abhiyan, which is currently running about 30 shelters for tribals, homeless and children, argues that many of the financing agencies and even the government initiatives are having a capitalist approach in their thought. – they are willing to finance only those social activist organisation that can make any profit or can help co-opt dissent. The initiative is giving a new lease of life to the countless homeless and those suffering from mental illness, by caring for them and curing them. Most importantly, this is being done by involving the local community and is furthered by those who have already gone through these rough phases in life and have overcome them. The very basic of our social life as humans is the mutual support that is offered by people to each other, especially by our families. These people, who are not offered this kind of emotional support by their families or don’t have them, end up relapsing into depression, anxiety, substance abuse and other mental illnesses. Here, they become each other’s support system. Such initiatives need to be aided and applauded for their efforts.